During proceedings of the Native Land Court, Māori often spoke in te reo Māori, while the minutes were written in English. 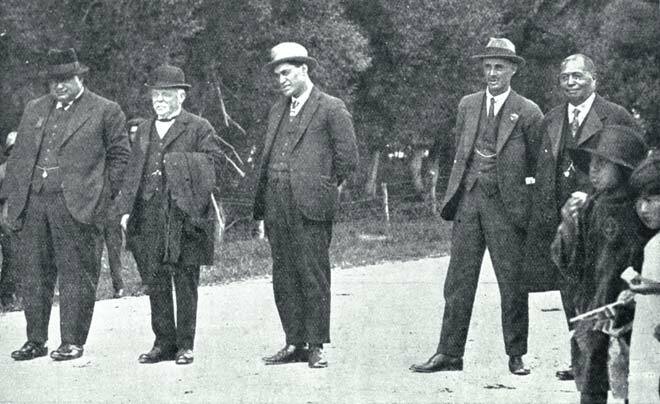 This group is arriving for a meeting of the court held on 23 January 1925 at Tuahiwi, North Canterbury, to hear claims regarding Ngāi Tahu land sales. Pictured are Hēnare Whakatau Uru, MP for Southern Māori; Chief Judge Robert Noble Jones, president of the court; H. Kahene, interpreter and clerk of the court; and J. Topi, member of the Legislative Council.